Want to connect with Izabela? 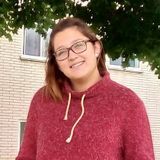 My name is Izabela, 22, and I am seeking to babysit part-time or occasionally in London, Ontario. I have a great experience with babies (newborns included) and children until 12 years old. I have Standard First-Aid CPR/Level C certificate and nowadays I am working part-time at LCC program after school. It is always great to stay with kids and learning with them. I am comfortable doing light meal preparation, shower, organize kid's stuff, homework, play supervision, swimming supervision, and craft activities. Available for take care of your child! Let's talk!